With the recent Gulf of Mexico oil spill from the Deepwater Horizon platform, natural disasters or challenges to society are right now on the minds of many people. When things like this occur, many of us wish we could do something to make a difference. But most often we don’t do the legwork necessary to find out how to help. 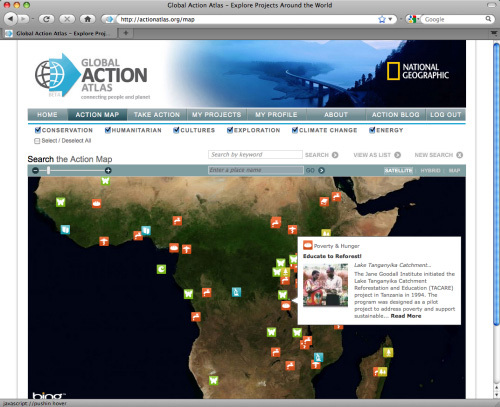 National Geographic is hoping that its new Global Action Atlas will assist us in putting our concern into action. The website is essentially a map showing where needs are, describing the need, and then pointing you to ways you can get involved. 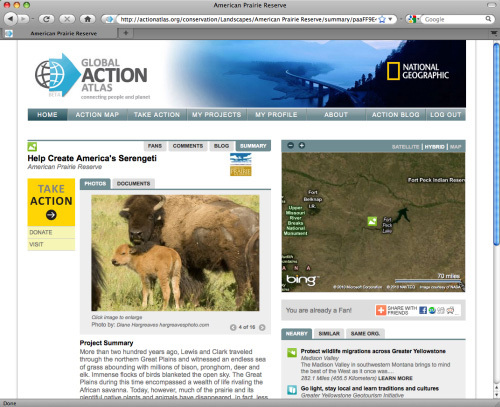 The company’s vision: “To tap the worldwide reach and convening power of National Geographic to mobilize a vast corps of concerned world citizens to support thousands of local projects that will collectively bring positive change to the world.” Sounds good for sure. Individuals looking to help in some way can search the database for causes using keywords, and then if they’d like, make donations straight from the site. To learn more visit: NatGeo’s GAA site.